Teltown is about four miles from Kells.Acess is down a signed cul-de-sac off the back road to Navan and the site itself is at the foot of the lane; there is very little parking. What is on view seems at first sight very unimpressive. Teltown is a large ring fort with views over the river. The photo gives some idea of the scale of the earthworks. The fort was of great importance for the Celts. 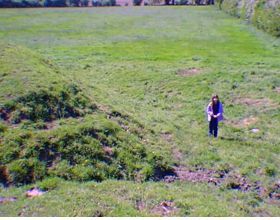 It was a prehistoric burial mound and games in honour of the the dead were held there in August, presided over by the King of Tara. The assembly was revived in about C12. There was also the strange and almost prophetic custom of the Teltown Marriage - arrangements which lasted apparently for a year and a day and were dissolved by the couple walking in opposite directions on the mound. HOWEVER....recently an alternative view of the mound, its purpose and history has been propounded by two gentlemen of Kells. That view is here summarised, without comment or prejudice, I hope. The Funeral Games, in this account, were those of Queen Teia Tephi who had journeyed from the near East in company with Jeremiah and the Ark of the Covenant. The Queen had also brought with her the Israeli system of laws, as outlined in Deuteronomy, which then became the law of Ireland - a felicitous turn of events, since the theory also holds that Irish people are all the descendants of the tribe of Dan. Teia had a palace at Teltown and died at the beginning of August 534 B.C.The Ark of the Covenant is believed to rest in Tara. For those interested in further reading, there are available in the town several pamphlets on these and allied topics, written by Mr J Hill and Mr M Pye. +353 46 49099 if you wish to know more. The restoration of the Teltown games is envisaged in the near future.